What Characterizes Personalities of Graphic Designs? Graphic designers often manipulate the overall look and feel of their designs to convey certain personalities (e.g., cute, mysterious and romantic) to impress potential audiences and achieve business goals. However, understanding the factors that determine the personality of a design is challenging, as a graphic design is often a result of thousands of decisions on numerous factors, such as font, color, image, and layout. In this paper, we aim to answer the question of what characterizes the personality of a graphic design. 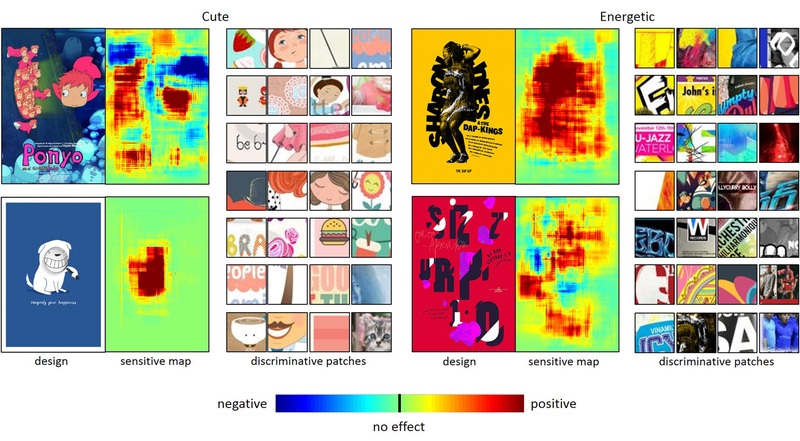 To this end, we propose a deep learning framework for exploring the effects of various design factors on perceived personalities of graphic designs. Our framework learns a convolutional neural network (called personality scoring network) to estimate the personality scores of graphic designs by ranking crawled web data. Our personality scoring network automatically learns a visual representation that captures the semantics necessary to predict graphic design personality. With our personality scoring network, we systematically and quantitatively investigate how various design factors (e.g., color, font, and layout) affect design personality across different scales (from pixels, regions to elements). We also demonstrate a number of practical application scenarios of our network, including element-level design suggestion and example-based personality transfer. We thank the anonymous reviewers for the insightful and constructive comments, and NVIDIA for generous donation of a Titan X Pascal GPU card for our experiments. This work is in part supported by two SRG grants from City University of Hong Kong (Ref. 7004676 and 7004889).